To be honest, I am an open-source (Linux and Mozilla) type of guy. This is mainly based on principle and the belief in an open, collaborative World Wide Web. That aside, I realize that the big three tech companies (Microsoft, Apple, and Google) offer products with advanced features that are hard to avoid or ignore. I love my smartphone that runs Firefox OS and my Ubuntu OS laptop, but the Metro UI in Windows 8 and the voice search capabilities of Android rock my world. Briefly, Apple and Microsoft were two of the earliest contenders in the personal computing market. Since the early 1980’s, they have had both software and hardware offerings on the market. Apple sold home computers with their Unix-based operating systems and Microsoft sold its Windows operating systems to computer manufacturers such as IBM. Microsoft’s hardware offerings came somewhat later and were in the form of keyboards and other accessories. They ramped up hardware offerings in the late 1990’s with the Xbox game console and more recently with the Windows Surface. 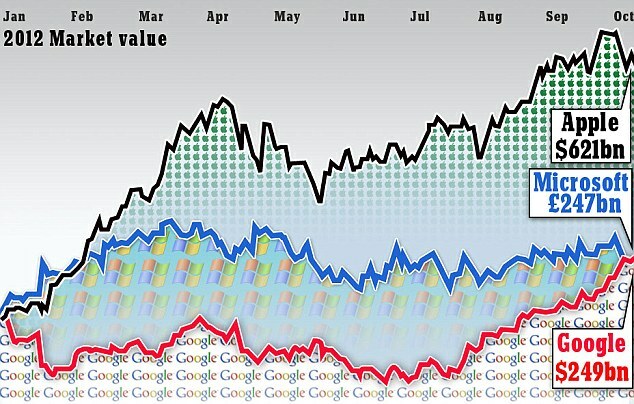 Traditionally, Microsoft dominated the market for operating systems and office suites for home and enterprise. Apple specialized in products that catered to design firms and offered premium products for home users. Google was founded in 1998 as a search engine for the web. They slowly grew as they began to sell pay-per-click ads and diversified their product offerings. They began to offer a free web browser (Google Chrome) and web-based cloud services, such as Google Docs (now Google Drive). They have evolved to a company that now offers its own Linux-based operating systems for both computers (Chrome OS) and mobile phones (Android). The introduction of an operating system and office suite by Google seemed to be perceived by Microsoft as a direct challenge to their superiority in those areas. In the meantime, Apple gained market share with a premium product line that caters to those with resources and those who want the best user experience and most reliable software with an array of advanced features. Apple seems to have cult status and has a strong set of devoted customers who would never consider any product that is not manufactured by Apple. Microsoft has slowly lost market share as Apple and Google have gained. This is mainly due to the traditional nature Microsoft’s software offerings. Many of their applications have lacked tie-ins to cloud computing and the Internet Explorer browser has been traditionally late in adopting new features and web standards. Since Microsoft appears to be acutely aware that they will probably never steal a lot of customers from Apple, they have set their sites on Google. Dropbox and pages don’t offer cloud document editing, so I am not going to add them to this comparison. I want to compare two similar products, and Office 365 and Drive share the most similarities. Google Drive allows from real-time editing, making collaboration simple. It also has a simple user interface and a litany of associated web services, from email to web conferencing, as outlined at the Google Apps for Business website. Microsoft offers similar features and services, but their online web apps do not yet support real-time editing and their software is less browser-based. You can edit Google Docs offline, as you can with Microsoft’s Office apps, but Microsoft Office is the recognized standard for the format of corporate documents. This is where Google Drive loses. Sometimes when you edit Office files and save them, they don’t format properly and you simply need Office to format them properly. I could go on and on about the “Big 3” tech companies, but I will quickly wrap things up. I think that each of the three have their own optimal use case scenarios. In my opinion, Apple simply offers the best, most feature-rich, and simplest operating systems and hardware on the market. They have computers, phones, and tablets that set the standard for design and operation in the tech sector. Google has mastered the web. They offer web services and software unrivaled by any other company. Microsoft owns office applications and enterprise systems. I think Microsoft can do much more as they move toward more web applications and as they polish their Office 365 web apps. I also think that the introduction of Windows 8 as an operating system for both tablets and computers was forward thinking and genius. They should capitalize on that offering and build out their browser-based services in order to gain a competitive advantage. Hewlett-Packard has done something amazing, albeit a bit late in the 3D printing game. HP has publicly acknowledged that they are planning the release of a series of 3-dimensional (3-D) printers. 3-D printers take a 3-dimensional design that has been drafted or modeled in a software application, which is usually a computer aided drafting (CAD) program, and creates it using a solid substance such as plastic or rubber. The printer reads the design blueprints from the CAD file that you create and builds the object layer by layer with a heated source medium (such as plastic from a spool). The process is explained in better detail at Mashable.com. The ability to rapidly prototype objects has far-reaching implications across all sectors. Doctors can custom make parts necessary for surgical repairs or custom-fitting hearing aids in less time. Mechanical engineers can rapidly build versions of a prototype for a project in order to test in real life situations. At home, a person could use preexisting templates or order blueprints from companies to quickly print out a replacement part if something breaks or needs replacement. I can already hear the cries of concerned anti-futurists who see doom and gloom for physical businesses that sell objects, or even e-commerce businesses that sell and ship physical products. I can’t imagine that every household will have a 3-D printer any time too soon. Maybe in a decade or two, but no sooner. Businesses and engineering firms will be the first to take advantage of the mainstreaming of this technology by HP. Technically, 3-D printing has been around since the 1980’s. It is only more recently that this technology has become more accessible and gone mainstream. With the advancement of 3-D design software applications that offer better ease-of-use, the reality of 3-D printing on a broader scale is finally becoming feasible. Like every new technology, there will be a fear that it will replace older technologies, but television didn’t wipe out radio, tablets didn’t wipe out laptops, and electric guitars didn’t render acoustic guitars obsolete. There may be some adjustments to the techscape, but not in any way that any of the apocalyptic naysayers may propose. In the early days of the Web and mainstream personal computing, most folks didn’t look under the hood of their favorite software applications or websites. That sort of thing was left to the super geeks and pocket protector-wielding nerds. In the early 1990’s, Microsoft had a stranglehold on the software market for operating systems and office applications, while Adobe owned the market for creative software suites. As the dawn of the new millenium approached, more and more casual computer users and web surfers began to tinker with building programs and websites of their own. This led to the creation on online repositories for code, such as Github. Online code repositories (repos) allowed people to create or modify programs or websites and to share their work with other enthusiasts. This series of events gave birth to the modern-day open source movement. According to The Open Source Initiative, “open source software is software that can be freely used, changed, and shared (in modified or unmodified form) by anyone. Open source software is made by many people, and distributed under licenses that comply with the Open Source Definition“. In other words, the programming code that makes up the inner workings of a software application or a web application is referred to as source code. The underlying source code is normally proprietary and protected from would-be tinkerers. Open source software is software that has source code that can be modified by users in order to add features or refine the way that the application works. After years of proprietary application development, patent trolling, and long, drawn out court battles to force licensing fees from anyone who had a dime, Microsoft has finally joined the new millenium and made its server architecture open source. Bill Gates has even played a part in opening up Microsoft to the world of open source by fostering dialog and listening to proponents of open source. Companies are beginning to realize that they couldn’t possibly hire the broad spectrum of talent required to compete with open source projects that have the benefit of being contributed to by anyone who has expertise and wants to add value to a project. Closed source stifles creativity. Open source is good for people, companies, and profits. It allows for collaborative problem solving, or “crowd sourcing” in order to bring in perspectives and talent that may have the right solutions to contribute to an initiative. Sometimes an amateur programmer can take an application and add a feature that makes the software better for everyone. It is even delivering mobile service to remote regions that traditional providers have not yet reached. So, how do software companies make money from open source? They do so by offering a basic piece of software or a service for free, while offering upgrades, support, and additional services for a cost. This model is explained by Opensource.com’s article on open source. This allows the casual user access to software, while also allowing companies to sell services for those who need technical support or additional upgrade packages. For example, I can use a web service called Google Drive for free. I can store up to 15 gigabytes (GB) of documents, images, files, or other data types and create & edit documents online with the service. This may be enough functionality and storage for a casual user. If I want to add more storage, I can upgrade to 25 GB for $2.95/month or 100 GB for $4.95/month. This is a fair price for cloud storage and Google seems to be profitable from this and its other services. Other open source projects get ad revenue from companies who pay for a plug during the install of software or an ad that appears before a video or audio stream plays. Some of these types of ads are annoying, but they are often worth it in order to access a free service or free content. Some open source products offer an ad-free experience as a premium feature for paid users. An open source project such as Android offers a mobile operating system for free to mobile manufacturers, but then recoups revenue via an app store that charges vendors to list apps or content in the marketplace. Open source is the business model of the future for software and communications. It is often tough for old school business people to wrap their heads around, but it is the way that the largest global tech firms are going, as evidenced by giants such as Google and newly emerging powerhouses like the Ubuntu Linux server software and desktop & mobile operating systems. I have no doubt that a collaborative economic model is emerging and that open source has been the impetus of its emergence. I also will argue that the future is open source with anyone who wants to debate, at any time. Many would agree that the debate regarding global climate change isn’t really much of a debate. Advances in technology allow us to bear witness to the changing face of our globe. Dan McGrath has somehow managed to bury his head in the sand, despite the permafrost of the polar vortex that is holding steady in the United States. In a blog article for www.globalclimatescam.com, Dan points to one glacier (the Pine Island Glacier in West Antarctica) as evidence against global climate change. His claim is that its melting rate has slowed in the past few years, and that it was not melting from human-induced climate shifts. He instead uses non-cited research from a British Antarctic survey to claim that the glacier was grinding on a marine shelf, allowing warm seawater inside the glacier, causing the prior melting that was recorded by the Brits. The problem with the blog posts and rants of climate change deniers is that the majority of the evidence and broader scientific community doesn’t corroborate their position. Dan’s blog post is a perfect example in that it mentions research that it doesn’t cite. It does have a link to another website, but it isn’t a credible source and it does not mention the Pine Island Glacier at all. Global climate change is happening. Many will acknowledge this shift, but they deny the fact that increased levels of CO2 are the root cause. Scientists first suspected that certain gases could create a ‘greenhouse effect’ over 150 years ago, according to the Scientific American. Since then, countless studies and a number of scientists have given merit to the claim that humans are having an increasing impact on the climate. Nasa’s website mentions that 97% of climate scientists agree that climate change is a result of human activity. The site also lists a number of scientific societies and includes quotes from them regarding their perspective on human-induced climate change. The American Meteorological Society has also released a statement that acknowledges the fact that the climate has always been changing, but attributes recent changes to human activity. It includes peer-reviewed research to back up its claims, and also proposes some predictions for the future of climate change. The weight of science and peer-reviewed research makes for a strong case, unlike the case presented by bloggers who rant without credible references. I believe in critical thinking and don’t take things at face value. That said, I do give creedence to peer-reviewed research and data. I also believe what I see in satellite imagery. So…Can Technology Save the World? For the first time in the history of humanity, we have the tools to communicate across the globe and propose solutions to problems that have plagued humans since ancient times. The Global Communication Newsletter is a publication of the IEEE Communication Society, a professional organization dedicated to the development of communication professionals and the propagation of communication networks worldwide. Despite their business interest in global communication, they are pushing forward with global designs for 5G speeds and multimedia-rich mobile networks. You can read more about their proposals and ideas in their newsletter. Outside of the United States, more people access the web though mobile devices than traditional computers, so a faster network with broader service areas and better multimedia support increases the ability for more human connections to be established than was ever possible in the past. This enables processes to be developed for us to gauge environmental and human needs and respond accordingly. One sticking point that is addressed in the newsletter is the lopsided distribution of bandwidth in the radio frequency spectrum that constrains mobile networks while providing underutilized bandwidth to television networks. Solving this would grow global communication and responsiveness, and would allow the spread of knowledge and techniques that could save the planet and its citizens. Some of the new ‘ecotech’ that we could spread virally, via our nifty new 5G networks, come in the form of fusion energy (if it is ever perfected), needleless vaccines, and nanoparticles that leech pharmaceuticals from water supplies that are subject to pharmaceutical waste. Other agricultural advances could increase yields while reducing pesticide use. An ecodesign website called inhabitat.com includes some awesome examples of the technologies on the horizon that could save the planet and its people. It also cites new developments in rapid communication as an enabling force for positive change. For all of the negative energy that is directed at technology in some circles, it is easy to lose sight of the promise of technological advances in the areas of environmentally-friendly design and global communication. I, for one, choose to look at the promise of technology and do rest my hope in technology as the missing link in solving the 21st century problems that our global society faces. Will 2014 be the Year of the Webtop? By now, everyone has heard about the cloud. For those who haven’t, the cloud, broadly defined, is the sum of all online real-estate, websites, databases, and applications that inhabit the web. Web 2.0, the current iteration of the World Wide Web, is rich with dynamic websites, tools, and storage spaces for users. The web has matured to the extent that web software is now nearly as powerful as the native software applications that live on the hard drive of your computer. In fact, Google’s Chromebook runs Chrome OS, a lightweight operating system that essentially lives on the web. In fact, most of its software programs run in the Chrome browser, cutting out the desktop entirely. 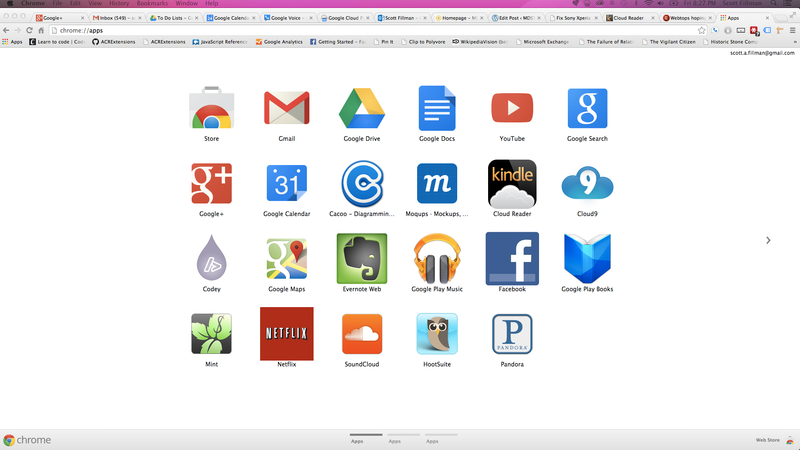 The web-centric nature of Google’s products, such as Google Drive has spurred other innovations in web apps. Dropbox, Microsoft Web Apps, and Evernote are all online storage and document creation tools that share some similarities with Google Drive. Thera are also online web development environments, photo editing tools, communication tools (video chatting, online phone/text messaging suites), and games that are nearly as powerful as traditional software applications. As web standards continue to extend the capabilities of browsers and web programming languages, we can expect a new crop of web applications that match or surpass those that are downloaded and installed on the hard drive of your computer. So, what does all of this mean for the average user? First, it means that large hard drives are becoming less relevant as online storage begins to gain popularity. Online “cloud” storage will keep your files safe in the event of a catastrophic hard drive or computer failure, and without the need for backing up files on an external hard drive. It also means that all of your files are available in a device-agnostic way. Next, it means that people can communicate and game within their browser, and with seamless software updates since their applications live on servers and are maintained by the software vendor. FInally, it means that people are increasingly able to do the things that they want to do within their favorite web browser. A lot of folks are very comfortable with their desktops. I want to make it clear that I am not of the opinion that traditional desktops are going anywhere. Instead, I would argue that people who do a lot of their work and/or play on the web will eventually want a desktop that they can access from any of their devices. There are already solutions in the works. Hashem Zahran dives in a little deeper into some of the distinctions between web desktops and web operating systems, and lists a few more webtop options on his website. There are only a few scattered resources available about web desktops/webtops, especially considering that it is a concept that is only slowly garnering the awareness of the general computer user. Cnet has a slightly dated article from 2009 that explores the trouble that virtual desktops were having in finding a niche, but this was before the Chromebook and Google’s release of a new breed of enhanced, rich web applications that make working on the web, within a browser increasingly viable. It’s great to be here in MDST 485! I Like the WordPress 2013 theme.